This award ranks the Patty Dwyer Group in the top one half of one percent of the more than 1.3 million Realtors nationwide. 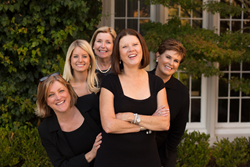 The Patty Dwyer Group of Alain Pinel Realtors’ (APR) Burlingame office has been recognized as one of America’s top real estate professional teams by Real Trends, as advertised in The Wall Street Journal. The team is a member of “The Thousand Top Real Estate Professionals,” a prestigious national awards ranking sponsored annually by Real Trends and advertised in The Wall Street Journal. This award ranks the Patty Dwyer Group in the top one half of one percent of the more than 1.3 million Realtors nationwide. The Patty Dwyer Group consists of Patty Dwyer, Isabella Lanza, Deb Kockos, Lauren Scott, Shealagh Meehan, Aris Markoulis, and Diane Dwyer. The Patty Dwyer Group had sales volume totaling $147,361,058, ranking 169th in the nation among real estate teams, as stated by The Thousand.